In order for the RBDB to finish all the work on the Mainline and Rotary safely they need to close the Mainline NB from Hill to Rotary Bridge from May 3rd to June 3rd . There will be a detour in place via Pinkie to Dewdney. 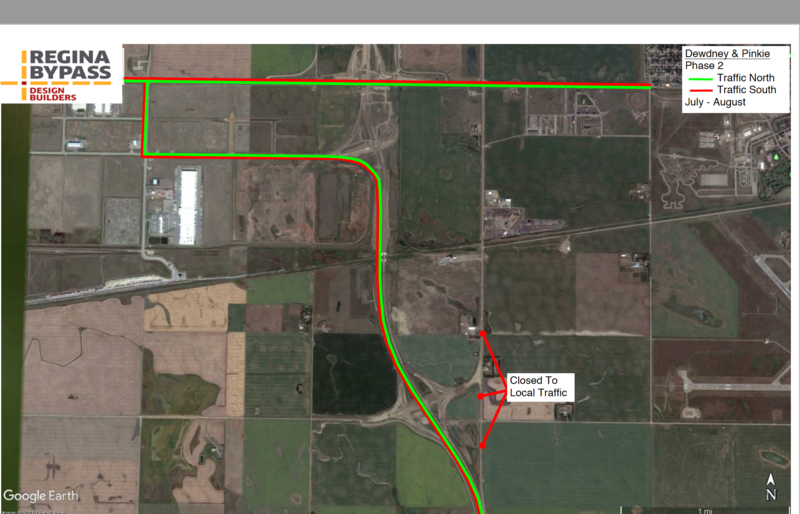 From April 1, 2019 to April 5, 2019 from 7:00 a.m. to 7:00 p.m. the Regina Bypass will be coring asphalt at 9th Avenue and Pinkie Road intersection. Flagpersons will be on site controlling all three directions of traffic, releasing one direction at a time. Regina Bypass will be closing Armour Road – between Pinkie and Condie – as early as Tuesday, September 25. All traffic will be detoured to 9th Avenue North which will allow access between Pinkie Road and Condie via the the new bridge. Armour Road is scheduled to be re-opened by October 25. As early as Wednesday August 29th, weather permitting, Regina Bypass the make the following traffic changes. – Full access to Pinkie Road will be open from Highway 1 West – via new Hill Avenue ramp. – All east bound traffic from Dewdney travelling to Regina will enter GTH at Fleming and use the new Regina Bypass. Motorists will exit at the new the Hill Avenue ramp to access Pinkie Road north and drive back to Dewdney Avenue. 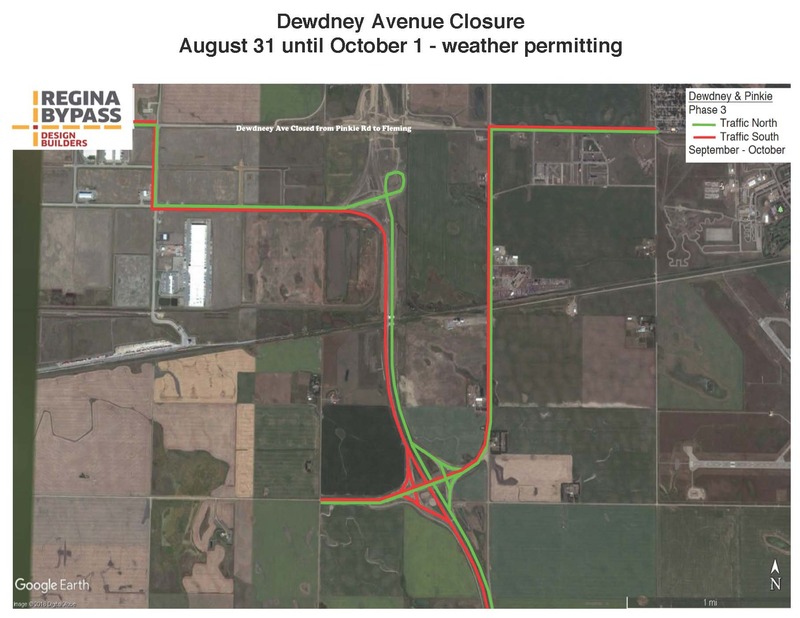 The newly aligned Dewdney Avenue will be re-opened to traffic the first week of October, weather permitting. All westbound Highway 1 motorists taking the off ramp to the GTH will now travel on the new West Regina ByPass (formerly Pinkie Road). 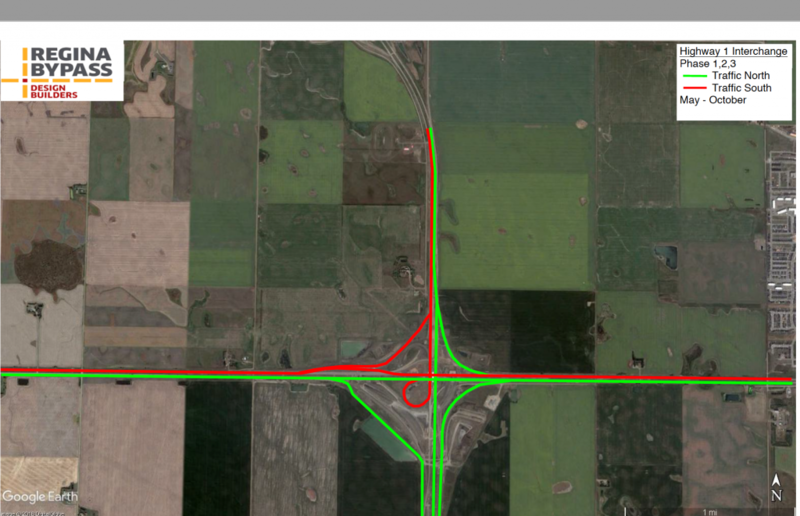 Eastbound Highway 1 to north bound traffic exiting to GTH will see a slight realignment on the south side of Hwy 1 that takes them over the new bridge and ramp and on to the new West Regina ByPass (formerly Pinkie Road). The new alignment north of Hwy 1 will move both north bound and south bound traffic on to the new West Regina ByPass (formerly Pinkie Road) that connects to Rotary Avenue then to the GTH and Dewdney Ave.
Access from Dewdney Avenue to Highway 1 will now be via GTH, Rotary Avenue and the new West Regina Bypass (formerly Pinkie Road). NOTE: During this construction phase Pinkie Road will be closed south of the railway tracks. Regina Bypass will be closing a portion of Centre Road from May 30, 2018 – June 13, 2018. Please see attached map for detour details. Regina Bypass will be holding an open house to discuss the upcoming work being done on Phase 2 of the project. This includes the south and west portion of the project. The open house will be held on Thursday, April 5 from 5:30 pm to 7:30 pm at the old Saulteaux Junction Gas Station on the corner of Pinkie Road and Dewdney Avenue. Regina Bypass team members will be in attendance to share information on road and bridge construction as well as upcoming detours. Everyone is welcome to attend. 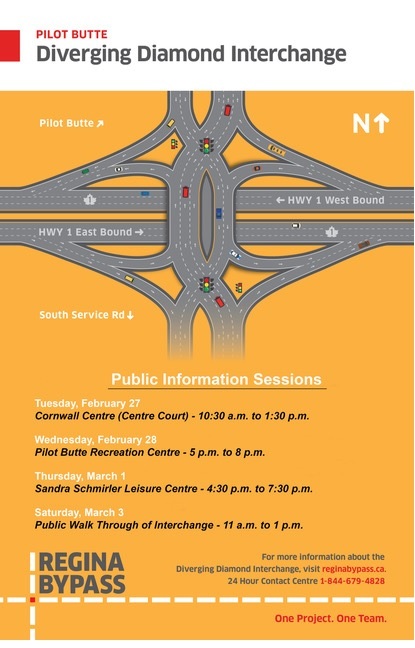 Public education sessions planned as Pilot Butte interchange is set to open ahead of schedule. Please follow link to RBDB website or download brochure to find out more. As part of the ongoing construction of the Regina Bypass, the eastbound on-ramp from the Balgonie Overpass at Highway 46 to Highway 1 East will be opening to traffic on Friday, September 1st, 2017. With the opening of the on-ramp, the eastbound Main Street detour through Balgonie will be eliminated. The left-turn lane on Highway 1 at Main Street will remain closed permanently. The median between the westbound and eastbound highway lanes will also be permanent closed. The Main Street detour will remain in effect for westbound traffic turning north on Highway 46 until the westbound off-ramp opens next week. Please find below a link to Traffic Notes and Maps that we received from Regina Bypass Design Builders.